Two Big Ten teams in the hunt for the regular season title both needed late-meet comebacks to keep their championship dreams alive while Oklahoma had yet another historical performance over the weekend. A few teams with NCAA championship bids at stake also competed in hopes of solidifying their chances at competing in late April. We’re not sure the freshman could’ve made a better debut into Minnesota’s vault lineup than with this perfectly stuck double front. 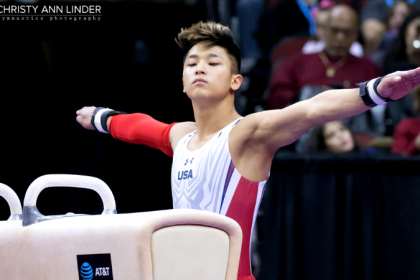 With Minnesota’s top pommel horse worker gone competing internationally for Canada, Esval seized the opportunity and upped his previous career high by a point and a half to steal a share of the event title against the Golden Gophers. Most performances by the Sooners are worthy of some type of accolade, but this weekend’s helped etch their names into history. With its 111th-consecutive win, Oklahoma’s men’s gymnastics team has matched the third-longest win streak in NCAA history. A win over California next week would break the tie the Sooners currently share with the UConn women’s basketball team who won as many games from 2014-2017. Hats off to the Sooners yet again! The Big Storyline: Oklahoma was in need of a good away score and got exactly what it needed by posting its best road score of the season while also defeating Navy. Yul Moldauer continued his stellar senior season by collecting three event wins, followed closely behind by teammate Gage Dyer’s two. 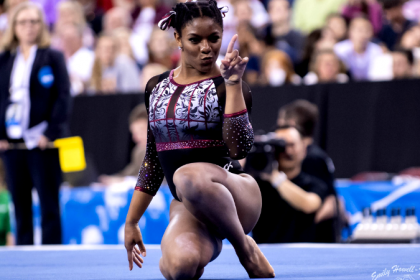 A tie by two Sooners on vault completed the event title sweep for Oklahoma. Navy’s best performance of the day came on pommel horse, where Jake Carlson and Ryan Orce tied for second to help the Midshipmen edge the Sooners by one tenth for the win on the event. Implications: Oklahoma will narrowly regain the top ranking next week while Navy will remain 10th. Records: Vitaliy Guimaraes’ share of the vault event title marks the first event title win for the freshman, as well as a career high. The Big Storyline: After falling behind early, Michigan used an explosive final vault rotation led by Anthony McCallum to overcome a near six-point deficit and come out on top of the Big Ten tri meet. Cameron Bock helped the Wolverines win both parallel bars and high bar en route to victory and keep Michigan in the hunt for the Big Ten regular season championship. Illinois grabbed two event titles and Johnny Jacobson took the all around win, but the Illini only won floor and were just edged by Penn State on several events to ultimately finish third. The Nittany Lions opened the door for Michigan to take the win with a subpar parallel bars rotation, but Stephen Nedoroscik’s pommel horse title and Sam Zakutney’s trio of top five finishes earned Penn State second place. Implications: Despite Penn State beating Illinois, all three teams’ rankings will remain the same. Records: Freshman Kevin Penev also played a big part of the Wolverine’s victory with career highs on floor (14.200) and vault (14.500). The Big Storyline: Minnesota won five events and won at least a share of as many event titles as it handily beat visiting Air Force in Sunday’s lone competition. Shane Wiskus picked up two event titles at the end of the meet, but it was a consistent competition by the whole Golden Gophers squad that saw them notch their seventh-straight 400-plus score. Air Force took itself out of contention for a high road score with pommel horse and parallel bars rotations with only one score on each reaching the 13s, but Ethan Esval performed admirably and was able to match Wiskus as a double event title winner. Esval’s rings title helped lead Air Force to its lone event win on the night as well. Implications: Neither team’s rankings will change next week. Records: Wiskus set new career highs on both parallel bars and high bar to win the event titles. The Big Storyline: Trailing by 7.8 points halfway through the meet, Iowa mounted a huge comeback to defeat visiting Ohio State and keep its Big Ten regular season title hopes alive. Despite the Buckeyes grabbing at least a share of five event titles, the Hawkeyes’ consistency once again was the difference maker. Iowa also managed to win despite suffering a one-point deduction for a lineup change after freshman Evan Davis suffered a minor injury on high bar. Alec Yoder’s wins on pommel horse and vault helped propel Ohio State to the early lead, but it was Nick Merryman who grabbed two event titles in the last two rotations to cap-off Iowa outscoring Ohio State by over 10 points in the second half of the meet for the victory. Implications: Due to the lower scores from both teams, Iowa’s and Ohio State’s rankings will not change. 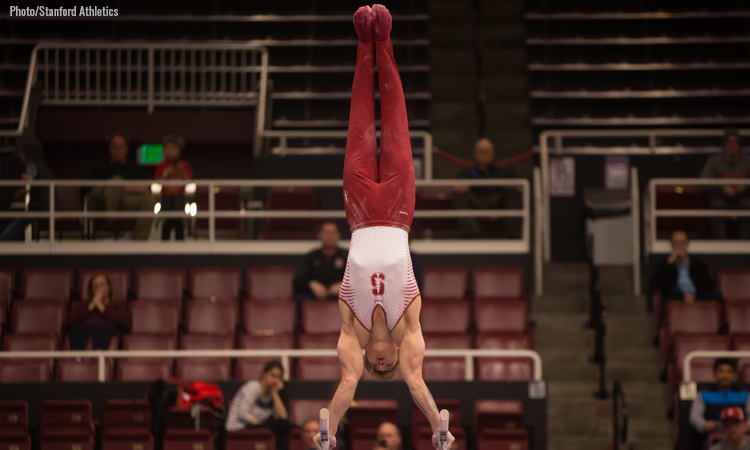 Records: Although he suffered an injury in the final rotation, Davis set or tied his career high on floor (13.800), rings (13.450), vault (13.950) and parallel bars (12.950). The Big Storyline: Army and William & Mary both won three events and three event titles, but freshman Matt Davis’ all around victory helped the Black Knights pull out the quad meet win. Cole Casanova placed second in the all around and won parallel bars to help Army while William & Mary was led by specialists David Allen, Spencer Schrandt and David Watkins. 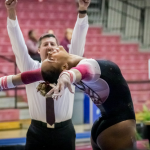 Springfield’s best finisher was Stephen Lewis who placed third in the all around and Taden Thurber finished ninth on high bar for Temple’s best performance of the meet. Implications: Next week, the rankings will not change for any of these four teams. Records: The Tribe used season highs on floor (68.200) and high bar (65.950) to notch their third best score of the season.